Part of the fun of taking photos with your iPad is sharing those images with others. 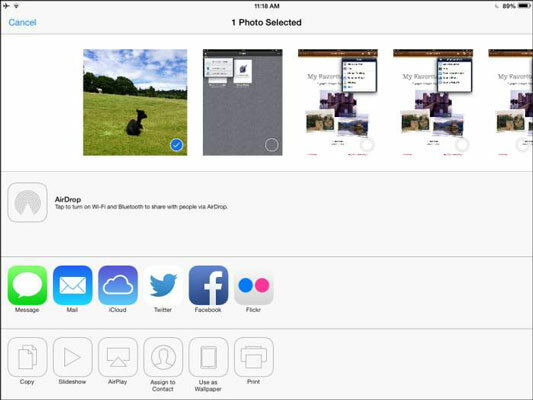 It’s easy to share photos stored on your iPad by posting them to Facebook, tweeting, sending via iMessage, posting them to a Flickr account, or sending them as e-mail attachments. Tap the Photos or Album tab and locate the photo you want to share. Tap the photo to select it and then tap the Share icon (which looks like a box with an arrow jumping out of it). The menu shown here appears. Tap the Message, Mail, iCloud, Twitter, Facebook, or Flickr option. In the message form that appears, make any modifications you want in the To, Cc/Bcc, or Subject fields for e-mail, or enter your Facebook posting or tweet text. The message and photo go to any recipients. You can also tap AirDrop in Step 4 above and then tap a nearby AirDrop–enabled device to share the photo with that device instantly. See the next task for more about this feature. You can also copy and paste a photo into documents, such as those created in the Pages word-processor app (available in the App Store for about $9.99). To do this, press and hold a photo in Photos until the Copy command appears. Tap Copy, and then in the destination app, press and hold the screen and tap Paste.